as seen by Alison MacGregor from The Gazette. 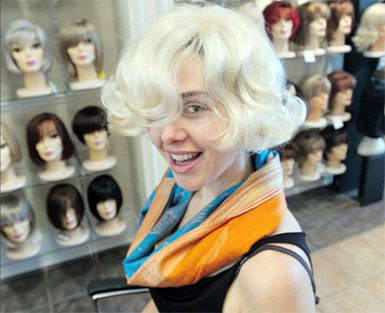 It's the beginning of a new chapter for one of Canada's oldest high-end wig retailers. With a fourth generation of the Seminaro family now helping to run Louis XIV Ltd., the company has just moved from dated facilities on Ste. Catherine St. E. to a new outlet a few blocks west in the Gay Village. 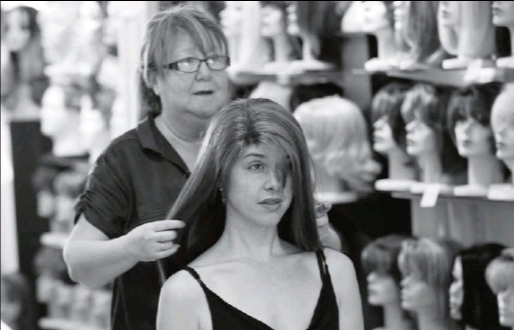 A lot has happened to the wig business over the half-century that the Seminaros have been operating in Montreal. Back in 1963, when the firm began operating out of an apartment, wigs were considered to be a fashion accessory that women would change to co-ordinate with each outfit. A stylish woman didn't mind that it was apparent she was wearing a wig or hair piece. "They had wigs in many colours", owner Rosina Seminaro said. "A woman would change her wig when she changed her dress. It was like going to buy candy." Nowadays, wigs are more often worn to create an illusion of beautiful, natural hair. Gorgeous, thick, lustrous hair is considered in many cultures to be a symbol of youth, health and social status. That link between lush locks and youth was reinforced during a recent visit to the shop when a thirtysomething model donned a stunning wig a shade lighter than her natural dark brown hair. "It's crazy," exclaimed Sophie Leblanc when she looked in the mirror. for the camera at the Louis XIV store in Montreal. "She looks like a teenager," Seminaro said, laughing. The first generation of Seminaros started in the wig industry after Rosina Seminaro urged her family to try their hand in the business, she and her younger sister Santina Guglielmetti, a partner in the business, recalled during an interview in an office where walls were stacked from floor to ceiling with wigs. Their mother and grandmother, immigrants from Italy, had just sold a restaurant and were eager to get into a new line of business. Seminaro noticed that wigs were trendy and urged her mother to try selling them. "I said: "If Grandma and you put the money together, I think you can do something," " she recalled. Sophie Leblanc models a wig for the camera, as Louis XIV wig shop partner Santina Guglielmetti styles it at the shop of Montreal. The business quickly grew by word of mouth and the company moved into its first storefront on the corner of St. Denis and Ste. Catherine Sts. in 1963 before moving in 1975. As teenagers, Seminaro and her sister would go to the boutique after school and hang out with their mother, grandmother and customers to learn the trade. "I used to come after school and eat french fries and watch the hairdresser," Guglielmetti said. "I took over the hairdressing of the wigs - it's 44 years that I've been combing the wigs." Today, the sisters run the store with the help of 10 employees, while Seminaro's son, among other family members, is a silent partner. Wigs and hair pieces have been used since ancient times to disguise hair loss, for religious and cultural reasons, for convenience or simply for fashion. Today, they are heavily used in the fashion, TV, film and performing arts industries. Wigs are also becoming fashionable again as an easy way to to alter one's appearance without resorting to a drastic hair cut, hair dye or timeconsuming styling. Much of the growth in the business over the last two decades has been fuelled by a proliferation of celebrities and fashion models that have admitted using - or are rumoured to use - hair extension and wigs for special events or in their daily lives. Some Hollywood insiders have called the widespread use of wigs and hairpieces as one of the industry's best kept secrets. Singer and actress Beyonc Knowles, for example, is rumoured to have a wig collection worth more than $1 million. And the trend is becoming more mainstream as regular folks increasingly view wigs, extensions and hair pieces as a simple and convenient way to have beautiful hair or to quickly change the way they look. The Wig and Hair Goods Industry, a U.s.-based clearing house for industry information, estimates that the wig and hair goods sector in the United States and Canada to be worth well over a billion dollars annually. Rising demand has even helped fuel a string of human hair thefts from hair salons in the United States, the New York Times reported last year. Seminaro says wig usage is much more widespread than many people realize. Natural hair thinning with age or hair loss due to illnesses such as alopecia, cancer and autoimmune diseases is common and some women and men choose to disguise such conditions with a wig or hairpiece, which can be undetectable if chosen with care, she said. Although many of her clients work in the arts, others are regular people who wear wigs for convenience and fashion, she said; some women even take wigs on vacation so they don't have to worry about styling their hair after spending the day at the beach. Improvements in technology have made wigs and hair pieces more comfortable and so realisticlooking that no one can tell they are being used. Back when Louis XIV was founded, most wigs were made of human hair, which is much more expensive and hard to maintain, Seminaro explained. Clients used to drop their wigs off every week to be washed and styled and the store employed a full-time hairdresser for this task. Today, most wigs are made of synthetic hair, which is more affordable and easier to care for and style, but which will not last nearly as long in everyday use as a human-hair model. Still, a quality wig that feels good and looks natural remains an investment, with prices ranging from $90 for a basic synthetic wig to over a thousand dollars for a high-quality, human-hair product. "For me, there are two kinds of wigs - the wigs you wear for Halloween and those you can wear every day," she said. Clip-in hairpieces, which can be added to a wearer's own hair - or to a wig - to create more volume, are priced from $40 to approximately $250, she explained. Most human hair used in wigs comes from India, China or Europe, Seminaro said. The most expensive wigs are handmade, with hair hand-tied onto a cap made of "monofilament" - a translucent material that allows the wearer's scalp to show through, making it appear as though the hair is growing from the wearer's scalp. Such wigs are particularly well suited for people suffering from hair loss. Another sought-after feature in wigs is a "lace front" that creates a natural-looking hairline, allowing hair to be pulled back from the forehead without the wig being apparent. The most lexpensive wigs are "full lace" wigs which enable wearers to part their hair wherever they want or pull it up into a high ponytail, for a completely natural look. Depending on the wig and the activities of the person wearing it, it can be secured with clips or a special adhesive. Louis XIV'S new location has more than a thousand wigs for women, men and children in stock, with a special section in the basement set aside for wigs reserved for opera and film productions. "You're not going to find anybody who has my stuff," Seminaro said as she led a visitor down a flight of stairs to the basement. Primarily a wholesaler, the business sells wigs to retail outlets across the country. It also serves members of the public but by appointment only. The store is discreet and serves only one retail customer at a time for privacy reasons, since many clients particularly those with illnesses like cancer, don't want to be disturbed while choosing a hairpiece. Seminaro declined to provide financial earnings information about the privately owned firm. Among the store's clients are the Opéra de Montréal and the Cirque du Soleil, as well theatre, film and television productions, fashion shows and photo shoots, and wellknown actors and actresses. Seminaro said she particularly enjoys fitting wigs on people who have experienced hair loss due to illnesses. She recommends that cancer patients undergoing chemotherapy come in for a wig-fitting before their hair falls out. "Sometimes they wait because they think that their hair hasn't fallen out yet," she said, "and then it does and they panic."